Google has tweaked its iPhone Google Mobile App for the iPad, optimizing it for the device's larger screen. The revamped app, at its core, is the same as the existing iPhone Google Mobile App that offers mobile search tools such as search by voice and search by My Location, which uses your device's location for local business searches. The big iPad optimization takes place with Web apps like Gmail, Google Reader, Maps, and Buzz. Google says it is also working on improving its application to take advantage of iPad-specific features. However, Google did not specify which iPad features it wanted to exploit or when the next version of its iPad-optimized search application would be coming out. But earlier this month, a post on the Google Mobile Blog said the company was "excited about the promise of tablet computers " like the iPad because of the form factor's "larger touchscreens, increased portability and rich sensors." 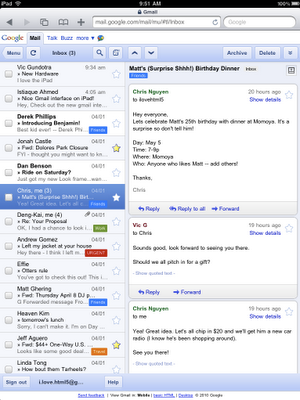 The blog post then highlighted Google's new HTML 5 iPad-optimized Gmail Web app that uses a double-pane layout similar to some native iPad applications like Contacts and Mail. Given Google's preference for Web apps and cloud-based services, it's likely that any further tweaks to Google's iPad services will be focused on better Web applications as opposed to improving its downloadable program for iPad and iPhone. So far Google is the only major search provider to place an iPad-optimized search application in the iTunes Store. Bing has an iPhone application that is usable on the iPad, but Microsoft has yet to produce anything that is specifically for the iPad. If a Bing for iPad application ever does show up, it would be nice to see Microsoft unify some of the company's other Web-based services into one application including Hotmail, Windows Live Calendar and SkyDrive.